An f/2.8 maximum aperture is effective in low light and provides shallow depth of field focus. 1:1 Macro Capability. A complex floating lens system ensures a uniform length when focusing and provides consistently sharp performance. An f/2.8 maximum aperture is effective in low light and provides shallow depth of field focus. The firmware can be downloaded from the Sony website. 1:1 Macro Capability. A complex floating lens system ensures a uniform length when focusing and provides consistently sharp performance. 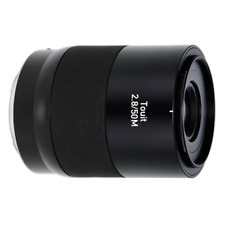 Zeiss Touit 50mm f2.8 Macro Lens. An f/2.8 maximum aperture is effective in low light and provides shallow depth of field focus. boxed complete as new and supplied with a full zeiss warranty as new. This is an ex demonstration item. Here is an opened box new Zeiss Touit 50mm f2.8 Lens for Fuji X-mount. ITEM FOR SALE :     . The Touit 50mm f/2.8 lets you capture the smallest things and the tiniest details at their actual size. The delicate structure of a petal, the tiny hairs on a cat’s fur or the seductive lines at the corner of the eyes – whenever a shot is all about the minute details, theZeiss Touit 50mm f/2.8 will delight and inspire. Usefull Link. This Dust will no effect your picture quality. Optics: No scratches, no haze, no fungus. Functions: Works properly. Why Choose Us ?. Restoration required, parts may be broken or missing. Model:Touit 50mm f/2.8M Macro Lens. Autofocus Yes. Focal Length 50mm. This item is intended for Japan market. The warranty, if included, is valid only in Japan. 100% Authentic Genuine Products. UK, GE, AU. The delicate structure of a petal, the tiny hairs on a cat's fur or the seductive lines at the corner of the eyes ?. whenever a shot is all about the minute details, the ZEISS Touit 2.8/50M will delight and inspire. Whenever a shot is all about the minute details, the ZEISS Touit 2.8/50M will delight and inspire. For Fujifilm. Angular field, diag. 31° / 26° / 18°. Coverage at close range 23.5 x 15.6 mm (0.93x 0.61?). The delicate structure of a petal, the tiny hairs on a cat’s fur or the seductive lines at the corner of the eyes – whenever a shot is all about the minute details, the ZEISS Touit 2.8/50M will delight and inspire. An f/2.8 maximum aperture is effective in low light and provides shallow depth of field focus. Autofocus Yes. 1:1 Macro Capability. Focal Length 50mm. 1 x Front Lens Cap. 1 x Rear Lens Cap. 1 x Lens HoodProduct Heightlights . 1 x ZEISS Touit 50mm f/2.8M Macro Lens (Sony E). An f/2.8 maximum aperture is effective in low light and provides shallow depth of field focus. Autofocus Yes. 1:1 Macro Capability. Focal Length 50mm. An f/2.8 maximum aperture is effective in low light and provides shallow depth of field focus. 1 x ZEISS Touit 50mm f/2.8M Macro Lens (Sony E). Autofocus Yes. 1:1 Macro Capability. Focal Length 50mm. 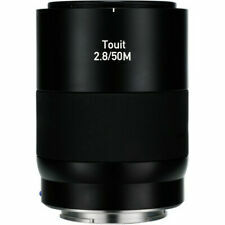 Zeiss Touit 50mm f/2.8M Lens (Sony E-Mount). The firmware can be downloaded from the Sony website. Zeiss Touit 50mm f/2.8M Macro Lens (Sony E-Mount). An f/2.8 maximum aperture is effective in low light and provides shallow depth of field focus. 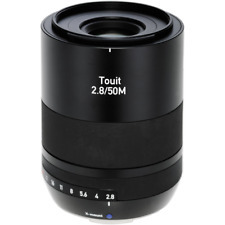 Carl Zeiss Touit 50mm F2.8 Macro (for Sony E mount). Our high standard of honesty has gained us a respectful reputation in Japan. SFunctions perfect. Almost like new. No signs of wear. AHas been used very preciously. Model:Touit 50mm f/2.8M Macro Lens. Autofocus Yes. Focal Length 50mm. This item is intended for Japan market. The warranty, if included, is valid only in Japan. 100% Authentic Genuine Products. Aperture Maximum: f/2.8.